Belated Eid Mubarak everyone! Whether you celebrated it simply or in a much more festive manner, I hope it was spent in the midst of family & friends. That is what Eid is all about - family & togetherness. I remember as a child, Eid was about new clothes, the delicious food, and of course the Eidi. Getting all dressed up with matching shoes & churiyaan (bangles); going from one house to another to meet relatives & discussing where we would get the yummiest treats; collecting Eidi in little purses, counting it up and then comparing who had gotten the most. As an adult, things remain the same but my perception has changed. I still get new clothes, but I try to make sure the less fortunate around me have Eid clothes too; I don't throw a fuss if there's a tailor mishap or if I don't have matching shoes. 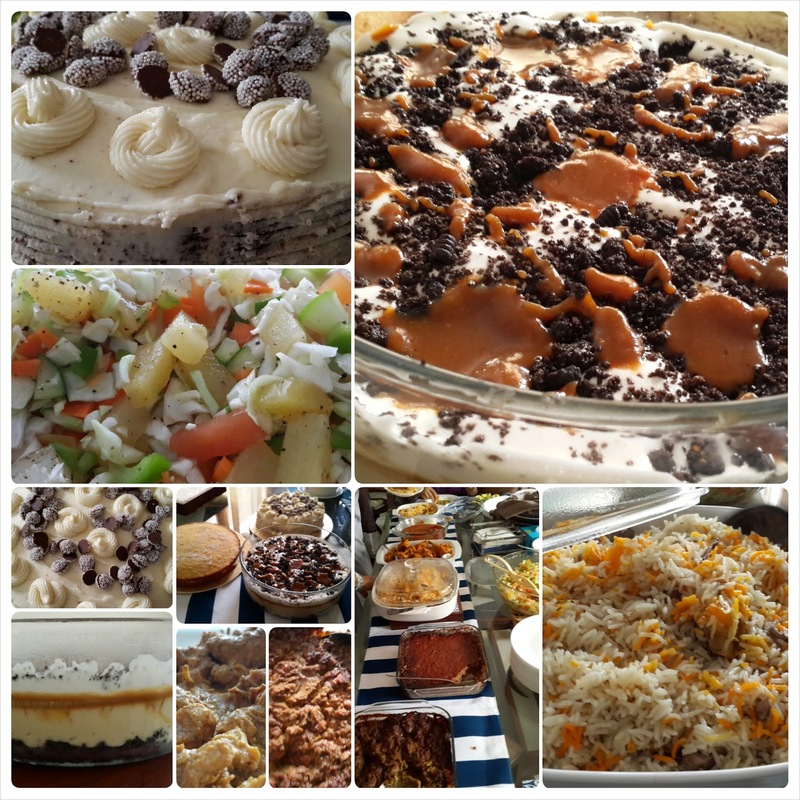 It's still about the food, but its about appreciating the love & care that someone went through to make a favourite dish for their nieces/nephews. It's about trying new things & complimenting each other instead of being a critic. Lastly, the Eidi. It's not about the monetary amount anymore, but a token which reminds me that while I might be an adult, I am still a little girl in front of the my family who loves me. Assembly: Can be assembled in a large glass bowl or in small glasses/round bowls for individual servings. Assembly should be done before serving or at 1-2 hours before serving so that the biscuit crust doesn't get soggy. Make-ahead: Salted Caramel can be made ahead by least a week and refrigerated, the custard can be made a day earlier. Mix cookie crumbs, salt, and butter in a small bowl until well combined. Set aside about 2 tablespoons of the cookie mixture for garnish. In a small bowl, whisk 1/2 cup milk and cornflour until combined. Set aside. In a small saucepan, heat the remaining 3 cups of milk until simmering. Remove from heat and set aside. In a steel bowl whisk egg yolks on medium speed using a hand mixer for about 3 minutes. To make the caramel, stir the brown sugar and water in medium saucepan over medium heat until the sugar is dissolved. Increase the heat, and cook without stirring until a thermometer reads 210 – 220 degrees F (100 degrees C) . The mixture will reduce a bit, and it will become a thick syrup similar to normal caramel. Remove from heat. With mixer on low speed, gradually whisk in the hot milk, then the cornflour mixture into the eggs. Don't mix it altogether because otherwise the eggs will cook & curdle. Slowly whisk in the caramel. Return the mixture to the saucepan and whisk constantly over medium heat, until the mixture thickens (coats back of a spoon) and a thermometer registers 175 degrees F (80 degrees C), about 7 to 10 minutes. Remove from heat; whisk in the butter, vanilla essence, and salt. Pour through a sieve/muslin cloth to make it more smooth & silky. Cover and chill custard for 4 to 5 hours. Place cream in a small bowl. Scrape in seeds from vanilla bean; add bean. Set aside. Stir sugar and 2 tablespoons water in a heavy saucepan over medium heat until sugar dissolves. Increase heat to medium-high; boil, occasionally swirling pan and brushing down sides with a wet pastry brush, until deep amber color forms, 5–6 minutes. Remove from heat. Gradually add vanilla cream (mixture will bubble vigorously so be careful). Whisk over medium heat until smooth and thick, about 2 minutes. Remove from heat; whisk in butter and salt. If any crystals/hard sugar has formed, stir the caramel over very low heat until the hardened pieces melt and the sauce becomes smooth. Strain into a heatproof bowl. Let cool slightly. In a bowl whisk cream and sugar with a hand mixer on high until soft peaks form. Press the cookie crumbs into the bottom of a large glass bowl. Set aside. 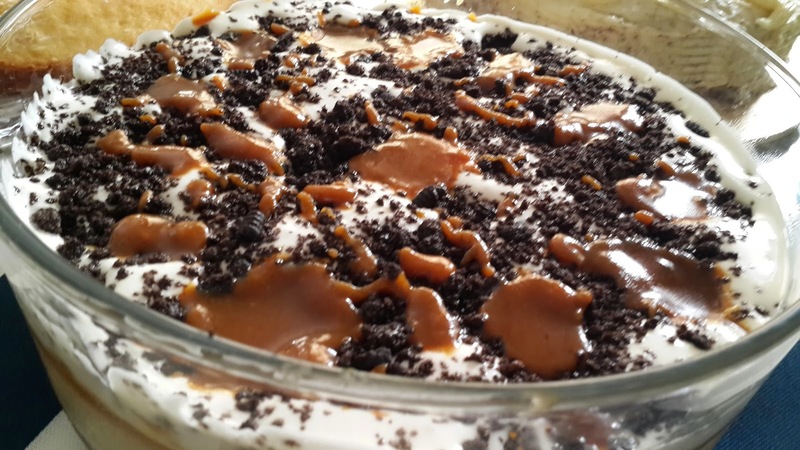 Spoon 1/2 of the salted caramel sauce over caramel custard/pudding and top with lightly whipped cream. Sprinkle with reserved cookie crumbs & drizzle of salted caramel (about 2 tablespoon). Make sure it is chilled before serving. 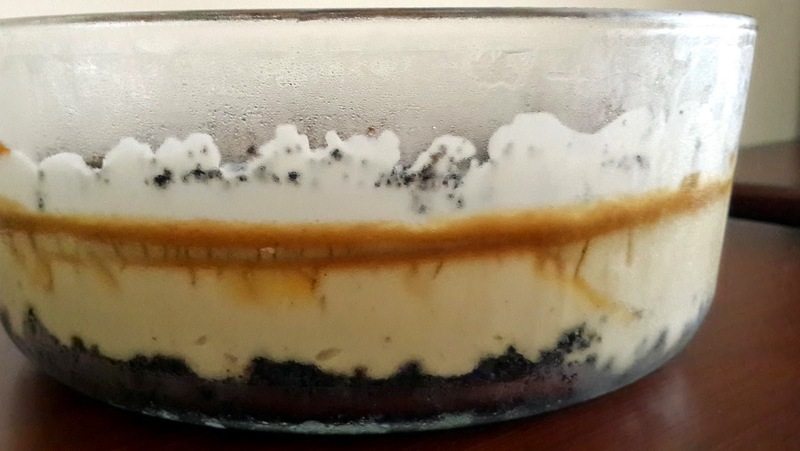 The salted caramel custard can be made in a big glass bowl or individual glasses/bowls as well. I had the thermometer, so it wasn't an issue for me. But you can do an an estimate and skip the thermometer.